The Adelaide Sax Pack! Think about this… four world-class saxophonists, one huge quartet sound, stacks of the cheesiest music you know you love but choose to hate, that's The Adelaide Sax Pack. 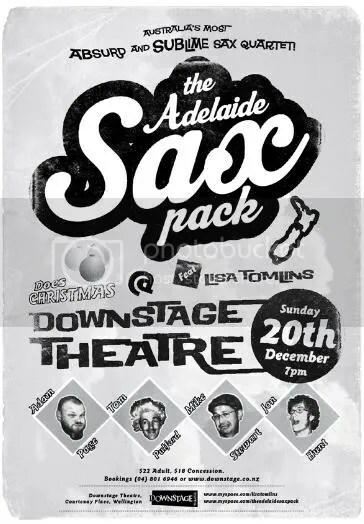 For one night only at Downstage Theatre on Sunday December 20th at 7pm, The Sax Pack will present their multi sellout Christmas show comprising of two sets of Christmas songs (and probably some 80's tunes thrown in too) as you've never heard them. It's guaranteed to lift your spirits and bring in the holiday season with a bang. They love it, and reckon you will too. Based in Adelaide, South Australia, the Adelaide Sax Pack are Adam Page (Soprano Sax), Tom Pulford (Alto Sax), Mike Stewart (originally from Hamilton on Tenor Sax) and Jon Hunt (Baritone Sax). They are a powerhouse of Saxophone glory that have sold out shows right across Australia and created quite a buzz amongst the Saxophone quartet community. Is there a Saxophone quartet community?? Well, there is now… and The Adelaide Sax Pack are the new messengers of funkin' good sax! Usually filling their sets with music from artists such as Whitney Houston, Rage Against the Machine, WHAM!, Van Halen and Split Enz to name but a few, The Adelaide Sax Pack recently performed the Australian premiere of Russian composer Sofia Gubaidulina's 'Transformation', a groundbreaking piece for Sax quartet and Trombone. This solidified the quartet's versatility and ability to look good in a dinner suit in a cathedral! NEWS FLASH: The Adelaide Sax Pack at Downstage will be joined by the amazing, the beautiful, the vocally superb Lisa Tomlins (Shapeshifter, Fat Freddy's Drop, Rhombus, TrinityRoots) for one of the most beautiful Christmas songs ever written. Will you enjoy this? Yes. Will you remember The Adelaide Sax Pack forever? Maybe not. Will you regret spending a night with The Adelaide Sax Pack less than your actions at the Christmas work function? Definitely. « My daughter is a fashionista?